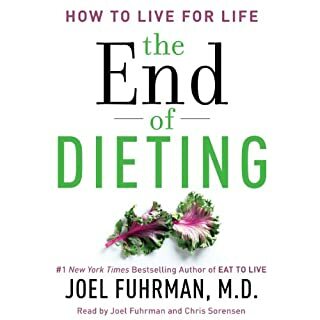 In The End of Dieting, Joel Fuhrman M.D., a board–certified family physician who specializes in preventing and reversing disease through nutritional and natural methods, and #1 New York Times best-selling author of Eat to Live, Super Immunity and The End of Diabetes, delivers a powerful paradigm-shifting book that shows us how and why we never need to diet again. 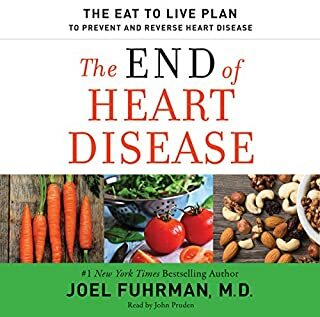 Dr. Joel Fuhrman, one of the country's leading experts on preventative medicine, offers his science-backed nutritional plan that addresses the leading cause of death in America: heart disease. 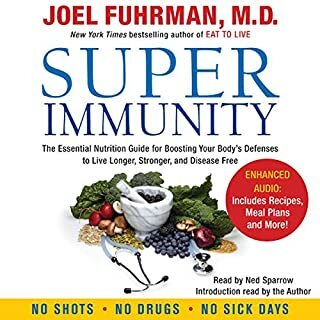 An expert in the science of food, Dr. Fuhrman speaks directly to listeners who want to take control of their health and avoid taking medication or undergoing complicated, expensive surgery - the two standard treatments prescribed today. Lose weight, eat as much as you want, feel healthy, and look great. 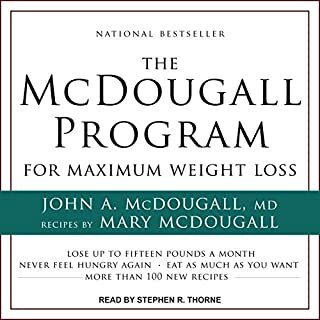 This may sound like an impossible dream, but with The McDougall Program for Maximum Weight Loss it is a dream come true for thousands of people. 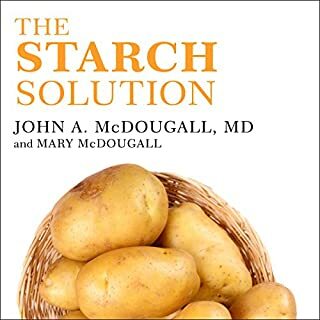 In this groundbreaking book, Dr. John A. McDougall draws on the latest scientific and medical information about nutrition, metabolism, and hunger to provide a simple weight-loss plan. ©2003 Joel Fuhrman M.D. (P)2007 Dr. Fuhrman Online, Inc. I believed I was already living a "healthy" life. Not long after starting this book, I realized I could greatly improve my health even more. So thankful for this book. This is a great intro to the nutritarian lifestyle. My only hold back is that there are visuals and references that are talked about in the print version but not available to an audible user. 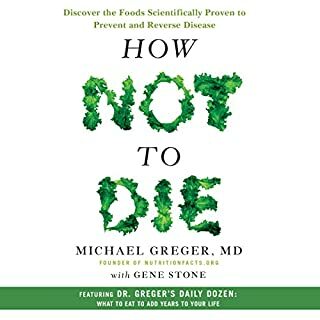 The advice from books such as Pritikin, How Not to Die, The China Study and many more is fairly uniform and consistent. Plant based whole foods is superior nutrition. But no matter how many times you hear advice, sometimes you need to hear it one more time for it to click. Dr. Fuhrman's Eat to Live "clicked" for me. The science is robust and his advice and his program has elegance in its simplicity. I bought the hard copy of the companion cookbook and will likely re-listen to Eat to Live a few more times. I was wary about downloading this audiobook based on the two poor reviews. Fortunately, I checked amazon's reviews and found over 270 5-star, more thorough reviews. 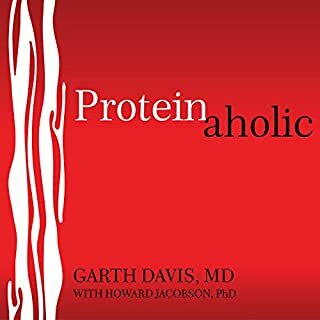 I downloaded and listened to this audiobook during each gym workout. I was blown away by the wealth of research and results given in this book. Let me quickly address the two reviews given here. Marianne, you're right when you say the recipes are not included in the audiobook version. 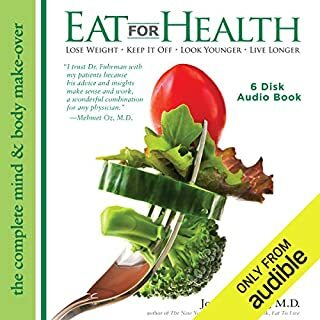 However, very early in the audiobook, Dr. Fuhrman announces a website - his own website if I recall correctly - which apparently has a wealth of recipes along with a forum to connect to other users. Because I was in the middle of a gym workout, I wasn't able to write it down and will have to go back to it to obtain the address. Rob, either you reviewed the wrong audiobook, or there's another reason for your inaccurate review that you haven't shared with us. I paid close attention and don't recall hearing even one mention of "miraculous". In fact, the only fad-type talk I heard was when Dr. Fuhrman was revealing the deception behind fad diets! And you mention how his quoting of medical studies turns you off... it's called supporting evidence. 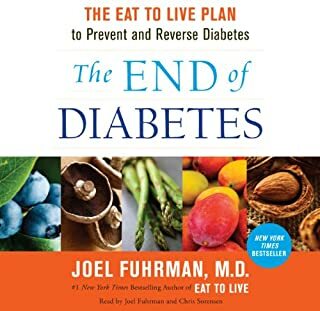 And unlike fad diets and so much of the confusing, conflicting information we receive, Dr. Fuhrman referenced a vast amount of credible sources with conclusive results. Lastly, I question your sincerity of actually listening to/reading this book. 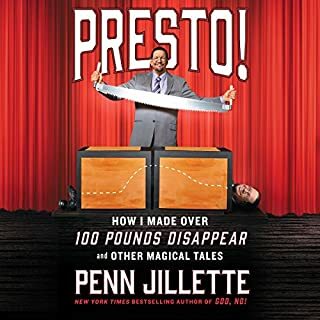 The whole point of the book is there is no miracle or way to cheat to lose weight. In fact, Dr. Fuhrman repeatedly reminds us that while short-term, immediate results are often favored by people looking to lose weight, the real importance are the long-term effects on our health and lives. That's precisely why the book is called, "Eat To LIVE". Lastly, Dr. Fuhrman recommends also reading/listening to T. Colin's book, The China Study. I just finished it; it's another EXCELLENT, worthwhile book. If you are looking for a book about healthy eating and how to transform your health this is it. I won't say that this plant based eating program is easy to follow. It is foreign thinking in the world of the high fat, high protein, high sugar, refined foods of the American diet. To me, it is simple to do at home where you can control what foods you stock in your kitchen--but the minute you leave the house for work or whatever it becomes more difficult. I'm just being very honest here--not negative. It is a definitely doable eating formula-- but it takes some planning and work to accomplish. That said--this eating style will transform how you feel. That transformation and renewed health then becomes the motivation to continue the program and work at all the changes required. The book is clear, positive and informative. Dr Fuhrman is an MD with a proven track record at motivating change in his patients. The program is extreme--but the book explains the whys and hows and the reasons behind the theory. To my mind even if you take away only half of what is offered here you will be better off. But be aware this plan requires that you rethink everything you think you know about food and healthy eating. Sound program - difficult to follow but the improvements you experience happen so quickly and are so dramatic it does seem miraculous. The reason I gave this only 4 stars is that I consider it to be incomplete. If you intend to really follow this program you will have to buy the book as well. 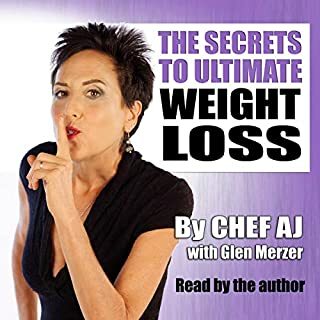 I think it is unfair to audible customers that some of the key charts and tables, the menus and recipes in the book that are necessary to fully implement this program are not provided to audible readers in a PDF. Have lost 33 pounds so far. Do NOT underestimate how potentially powerful this eating system can be, if you first understand it, and second, follow it. I recently had my blood pressure checked again, and with activity, it was 120 over 68. Enjoyed listening to it (didn't think I would). The information really 'clicked' in my head and am walking away feeling more knowledgeable about nutrition. I don't know, maybe this time I was ready to 'hear' it. I am annoyed that the recipes are not included and maybe Audible should mention that in the description. I'm a foodie and I probably would have bought the book instead of the audio version because of it. 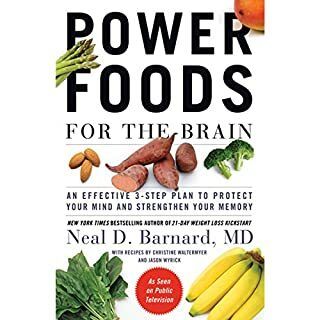 I emailed Dr. Fuhrmans' website stating I bought the audio book from this site and if they had a link to the recipes. Nope. Bummer. You have to become a member and pay a monthly fee for access.... not. I guess if I search the WWW I'll find something (or I guess I'll buy the darn book) :o). Nonetheless... This audio book is great. Recommended. I have been following the Eat To Live regimen for two years. I have never before been able to lose weight so effortlessly... my migraines are gone... I cured my high cholesterol in 30 days... my mother cured her high blood pressure and angina in 6 months. I love eating the Eat To Live way and would never go back to old habits. For those who have an open mind and a sense of purpose, Eat To Live is miraculous indeed. 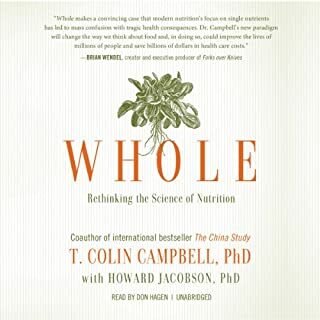 Also read The China Study by T.Colin Campbell and Dr. Fuhrman's Nutritional Excellence. I very much enjoyed this books format and nutritional advice. I've been doing something similar with my veggie focused meals, and it's nice to see studies that back up this way of thinking about food. 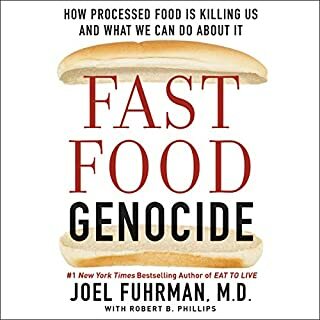 Would you ever listen to anything by Joel Fuhrman again? Most likely not if he is reading it. What didn’t you like about Joel Fuhrman’s performance? He miss pronounces words frequently. If you could play editor, what scene or scenes would you have cut from Eat to Live? I think this book has great information it's to bad he thought he had to read his own work. 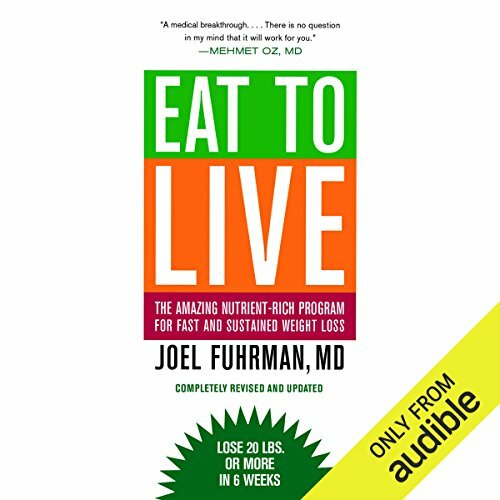 Would you listen to Eat to Live again? Why? Yes, in fact I've listened to it a couple of times and physically read it 4 times! It is the absolute best summary of what is currently known in nutritional science today. The back of the book has over 1,000 scientific references so you can double check what the author says and see that it is indeed based on science, not just his opinion. I have personally gone back to the original research articles in several instances and especially in those areas which sounded the most different from previous info I had heard or read, and checked out the reliability of his statements. He proved to be true in every instance! In fact, in a couple of cases his explanation of what the study found was better than the abstract of the original article itself. This author has true intellectual and scientific integrity. What other book might you compare Eat to Live to and why? 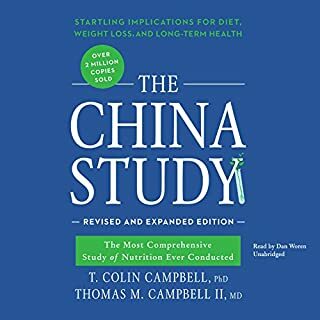 The China Study, as it's written by a Professor Emeritus of Nutritional Biochemistry and is very solidly scientifically based, and comes to basically the same conclusions about what foods are best for humans to eat, and what should be avoided, and why. What about Joel Fuhrman?? ?s performance did you like? He has a very friendly congenial sounding voice and is easy to relate to. When I first read this book (after checking out a few sources to be sure of its accuracy), I felt like jumping for joy! I had found the ultimate prize among nutritional books. Prior to reading this I was probably one of the leading authorities on foods, nutritional supplements, vitamins, minerals and herbs and why they were good for you. After reading this my knowledge base was expanded Considerably, far more than I would have thought possible. 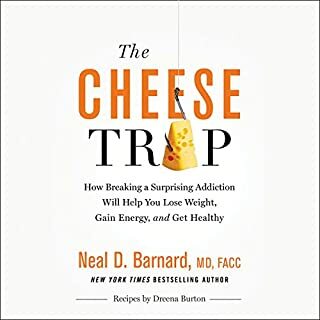 This is the cat's meow of books on what to eat and why it's good for you, with clear explanations, and examples of people's health improving (not just losing weight) from many annoying chronic health conditions. If you care about your health, and especially if you have any chronic health conditions (CAD, diabetes, arthritis, RA, sarcoidosis, etc.) 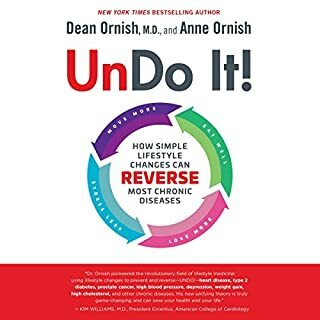 read this book, at a minimum it will (if you follow the dietary and lifestyle changes it advocates) make you feel much better, and be able to function at a higher level! I believe what this book preaches, except it suffers from the fact that there is actually not a ton of things to say, but has been inflated to be long enough to warrant being a book. It is easier to take in paperback, because you can skip the repetitive parts, but with audio books, you cannot.